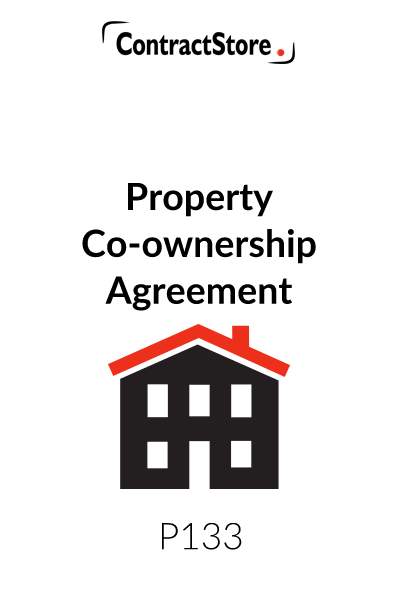 This property co-ownership agreement is for two individuals – such as partners, friends or students – are registered as the owners of a house or flat or other property and they wish to record how their interests in the property (and mortgage) and the running costs are shared. The document deals with the percentage shares of ownership as well as income and expenditure. It also deals with the procedure if one or both the owners wish to sell their interest in the property. It can easily be amended to include additional owners if there are more than two. 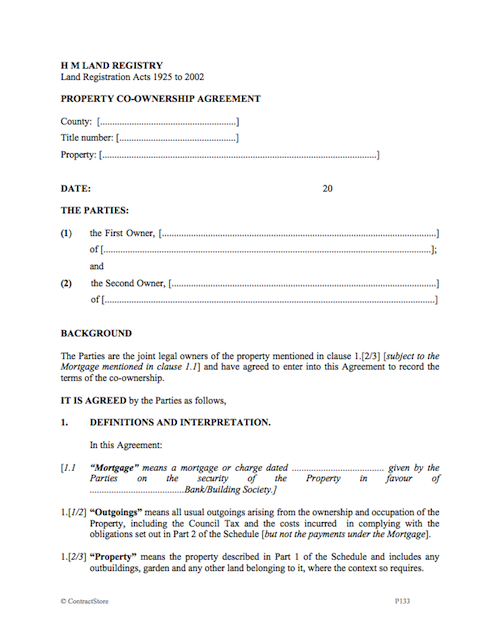 You would buy this document if you are involved in a joint ownership of a property and wish to agree how this will be managed. 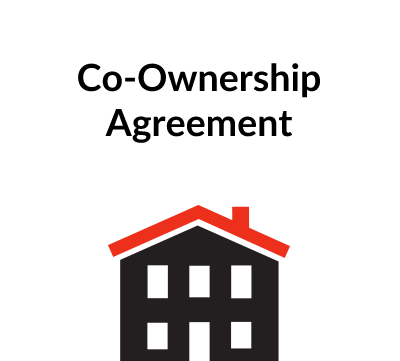 This Property Co-ownership Agreement is designed for use by two joint owners of a freehold or leasehold property to record the terms agreed between them for ownership. It could easily be amended to include additional owners if there are more than two. This Agreement is ideally suited to a couple living together in the property or to students buying it for their time at university. It should not be used if the property is used as an asset of a business. The Agreement also deals with the position if there is a mortgage or charge. The parties will have to consider a number of points which will arise. The Agreement covers these. There are provisions giving each of the owners the right to call for a sale, and although this reflects the statutory position, additional terms have been included. These additional terms will apply to any sale as well. There is a provision for the registration of a restriction at the Land Registry to protect the owners. This is only available if the title is registered. The Agreement can be used either at the same time as the purchase of the property or later. The heading should be completed if the title to the property is registered at the Land Registry. The postal address for the property should be given. The full names of the parties should be given along with their respective addresses. The addresses may, of course, be the same as the property address. Any additional legal owners should be added here, calling them “Third Owner” etc. and the rest of the Agreement will require modification. All the definitions should be checked and blanks completed. The reference to a mortgage in clauses 1.1 and 1.2 (along with other references to “Mortgage” in the rest of the document) should be deleted if there is none, and the paragraphs should be renumbered. The definition of the property should be completed in Part 1 of the Schedule. The postal address may be sufficient, but a fuller description can be included, if appropriate. It may be appropriate to include a reference to additional land or other buildings, for example. The parties will be making (or will have made) separate contributions towards the purchase price. If there is a mortgage, then obviously the parties will be contributing towards the balance. This clause gives the parties separate shares so that each share will belong to the individual. The share will remain in the individual’s estate on his or her death. The clause declares a trust, though this arises by law in any event. The reference to “tenants in common” is the technical term for ownership in separate shares. The other type of joint ownership is called a “joint tenancy” where the owners do not have separate shares, but this Agreement is not suitable for that. The separate share of each individual is fixed as a percentage of the whole. The aggregate of the percentage shares should be 100%. The value of each share will ordinarily reflect the amount of the contribution made towards the purchase price. A mortgage will affect the position and so the parties will have to agree how to take this into account in fixing the percentage shares. There are tax consequences in owning shares in a property and so expert advice may be required. The parties will want to decide how all the costs of ownership and occupation are to be paid. If both are living in the property, then perhaps the costs should be shared equally. On the other hand, the costs could be shared in the same proportions as ownership. Alternatively, they could be split so that some are covered by one method and the rest by the other. It is up to the parties to agree this and modify the clause. The reference to Outgoings does not include the payments under any Mortgage. The loan under any Mortgage was paid to the parties jointly and so they are, as between themselves, equally liable for it and so it would be normal for the parties to make the payments in equal shares. This is covered in clause 10. This clause is necessary as there can be a legal argument that one owner should pay an occupancy rent to the other especially if the shares are not equal or if one is not living in the property. The parties’ obligations are set out in Part 2 of the Schedule. They are the basic obligations to ensure that the property is protected in value. After all, the property is a form of investment for the parties. Other obligations may be added to suit the situation. The parties may derive some income or gain from the property before it is sold, and so this will be shared. They may rent the property for a while or sell off part. This clause stipulates how the money should be divided between them. This clause will prevent either party selling his or her beneficial share in the property or creating new trusts without both being in agreement. These are the provisions relating to any sale. The parties will have to decide on the number of days’ notice which will have to be given under clause 8.1. The notice should be long enough to ensure that both parties will have time to find a new home. Clause 8.3 gives either of the parties the option to purchase the beneficial share of the other. If there are more than two owners, you will need to modify this clause to show if the option relates to all the other shares or just one of them, or perhaps to either possibility. The period of notice will, of course, have to be long enough to give the buyer time to make the funds available and the seller time to find new accommodation. The parties can apply to the Land Registry for the registration of a restriction, if the title to the property is registered. This will ensure that one owner could not sell the property without appointing a second person to act as a co-trustee if the other died. This is a standard Land Registry clause. The appointment would be done in the sale documents at the time. The parties should refer to the Land Registry web page (www.landregistry.gov.uk). They will need to refer to the Practice Guide number 24 (Private Trusts of Land) for further help. This clause deals with the points mentioned above, if there is a mortgage. Once the Declaration has been finalised, it should be produced in duplicate. Both copies should then be signed by both parties and dated. Each party will keep one copy.